Maroubra is using Smore newsletters to spread the word online. 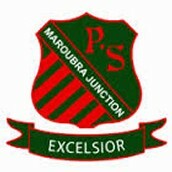 Welcome back to Maroubra Junction PS for another term. We are looking forward to working closely with students, parents and our community in ensuring improved student outcomes for all. All enquiries about student progress should be directed to the class teacher. The Assistant Principal or Principal can discuss wider or whole school concerns. Please make an appointment with the school office or by ringing 9349 8333. During the teaching / learning of English children will participate in rich and diverse literacy activities both in whole class and group work situations in reading, writing, speaking and listening, handwriting and using digital technologies, spelling, grammar, punctuation and vocabulary, thinking imaginatively and creatively, expressing themselves and reflecting on learning. This term, Year 1 will focus on the English key concept of 'stories from other times, places and cultures'. We will be studying a variety of fairy tales and fables. Year 2 will focus on the use of visual literacy in print, sound, images and ipads to compliment the science unit 'Push and Pull'. Students will also focus on writing informative texts such as explanations. All students will have an opportunity to speak in front of the class each week. The term’s news roster outlines the topics to be presented each week which was handed out in Week 1. Please discuss and practise with your child their news topic at home so they are able to feel more comfortable and confident when it is their turn to speak in front of the class. This term students will continue to revise and expand on their knowledge and understanding in number, patterns and algebra, measurement, space and geometry. They will be provided with opportunities to develop and use a variety of mental strategies, hands on activities, interactive whiteboard activities and written work to meet their individual needs. A strong emphasis on working mathematically and problem solving strategies will continue to be incorporated across all strands. Mathletics continues to be our main Maths homework. We strongly recommend that parents allow their children time to complete their mathletics homework on the computer. Please inform your class teacher, if your child does not have access to the internet at home. An alternative maths activity will be set on the homework sheet for those students with no internet access. Students will be studying the unit of work 'Workers in the community'. This unit provides opportunities for students to explore the different roles and responsibilities of people they interact in their family, school and community.The unit focuses on how these roles and responsibilities connect to meet needs and wants. Students will be studying the unit 'Push and pull'. The unit provides the opportunity for students to explore the force of push and pull. Through investigations, students observe and gather evidence about how these forces act in air and water, and on the ground. Students identify the effect of the pull of gravity and learn that both air and water can ‘push’. As part of our technology lessons Stage 1 will continue working with i pads. I pad apps such as Popplet, Book Creator, Puppetpals and Explain Everything will be used to support student's learning across the key learning areas. Classes will also be using the computers in the computer room working with the publisher program. Year 1 will cover creative and practical arts in their classroom. Year 2 will continue to participate in CAPA (Creative and Practical Arts) groups this semester. Each class will rotate every 2 weeks to experience music, dance, drama and art with various teachers. Stage 1 will be focusing on the Life Education program this term. The focus is on healthy living and making healthy choices. Drug education will also be covered this term. Our sport program has been developed to integrate gross motor and fundamental movement skills. This term Stage 1 will focus on mini games to further develop body coordination and team work for example T Ball, Kanga Cricket, Futsal and Auskick to name a few. Year 2 will be participating in the swim school program for 2 weeks. This is an intensive learn to swim program which develops water confidence and provides students with basic skills in swimming, water safety and survival. have them in the morning when they arrive at school. Hats are part of our school uniform so please ensure that your child has their hat in their bag before leaving home in the morning. As the weather is now starting to get warmer we recommend that students apply sun screen on in the morning prior to coming to school.They may bring a small sun screen tube to re apply during school time. Children will need to have their own glue stick to use in class. We recommend either BOSTIK or UHO glue sticks as they are a better quality to use. Year 2 are required to have their own set of lead and coloured pencils, sharpener and eraser at school every day. Weekly homework goes out every Friday and needs to be returned the following Thursday. Please read the reminders and important messages in each week's homework sheet.